When we sit down with a family, our primary goal is to help create a fitting, memorable and affordable service, one that creates the opportunity for the survivors to tell their loved one’s story. Together, we explore the wide variety of services and products available, as well as a wealth of creative ideas and suggestions to help the family begin their healing. Together, we'll design a funeral or memorial service that suits their needs. Families who come to us know that years from now they will have deep peace-of-mind, because in coming to us, they've done their best to honor their loved one. June 1, 2011, Saginaw, Michigan — Funeral home founder Balthas G. Gugel (pictured) was born on November 27, 1876, in Frankenmuth, Michigan to German immigrants. Balthas Gugel developed significant business experience before coming to Saginaw. In 1888, at the young age of twelve, Balthas and his brothers, Fred and Paul, opened Gugel Brothers, a mercantile in Frankenmuth. Mr. Gugel served as its bookkeeper until 1896. He then became manager of Frankenmuth Brewery. In 1904, when the Village of Frankenmuth became incorporated, Mr. Gugel served as one of its first Trustees. In 1906, he left the brewery to become manager of the Exchange Hotel, known today as Zehnder’s of Frankenmuth, before returning to the business of merchandising when he opened a store and operated the post office in nearby Gera. Mr. Gugel moved from Frankenmuth to Saginaw in 1909 where he learned the business from one of Saginaw's most successful and respected early undertakers and business leaders, Charles L. Benjamin (pictured). Mr. Benjamin was born on May 13, 1841, in Independence (Oakland County), Michigan. He moved to Saginaw in 1867. His path to business success in the local community began when he first served as City Marshall in 1868. Benjamin saw the need for police and led the development of the Saginaw Police Department. In addition to being one of Saginaw’s most notable businessmen, Benjamin was a true pioneer undertaker. In 1873, he opened the Benjamin Funeral Home at 300 S. Hamilton Street, becoming the first successful undertaker in the area. In 1880, Benjamin helped form the Michigan Funeral Directors Association, the first such organization in the United States, serving as the association's second president in 1882. Also that year he helped form the National Funeral Directors Association, which is now the largest funeral service organization in the world. He served as its first president until 1884. He was then elected as one of Saginaw City's first Mayors, serving from 1884-1886. In addition to operating the funeral home, Benjamin ran a livery stable from the Hamilton Street building, providing livery service in the community and horse-drawn funeral coaches (as seen in center of photo). Charles Benjamin died on November 19, 1909, at the age of 68 and is buried in Oakwood Cemetery in Saginaw Township. Charles Benjamin's son, Mills I. Benjamin (pictured), was born on January 6, 1866, in Independence (Oakland County), Michigan. He moved to Saginaw in 1867 with his parents. Mills Benjamin worked with his father at the funeral home where he initially took on the responsibilities of operating the livery stable. Balthas Gugel continued to work with the Benjamin Funeral Home through the business's transition to Mills Benjamin following Charles' death. Mills Benjamin died on September 20, 1950, at the age of 84 and is buried in Oakwood Cemetery in Saginaw Township. At the time of his death, the Benjamin Funeral Home had closed. His funeral was handled by the Gugel Funeral Home. The building used by the Benjamins for the operation of the Benjamin Funeral Home and their livery service is known by today's local residents as the outdoor sporting goods store The Stable—a name tie-in from the days of Benjamin's livery business. The building served as the main backdrop in the 2011 ghost-hunting film, A Haunting on Hamilton Street 2 -- The Stable. Note the name M. I. Benjamin over the the store's entrance. The year 1882 that flanks the name reflects the year the building was expanded. The photograph of Mills I. Benjamin, as seen above, along with his mortuary license, hangs inside the store today. After spending time with Charles and Mills Benjamin, Balthas Gugel opened the Gugel Funeral Home in 1911. The business was originally established from Gugel's residence at 620 Ames Street at the corner of Harrison Street in Saginaw. In this era, as there were relatively few established stand-alone funeral homes in communities across the United States, it was common practice for the undertaker to prepare and hold services in the homes of the deceased where the family would receive friends in the home’s parlor, the largest and most formal gathering space. Also at the time, few death notices appearing in the newspaper included the name of the funeral home handling the services. The first known published death notice for Gugel Funeral Home. Wednesday, July 17, 1912, Page 10. Also among the items in our archives is this itemized receipt dated December 24, 1919 for the funeral services of Mr. Victor Mazewsky of Carrollton, Michigan. As noted in the advertisement below, Mr. Gugel provided "Hacks for all Occasions". Hacks is an English reference to the service of transportation by horse and carriage or automobile. Mr. Gugel later provided ambulance service in the community to transport the sick and injured to the hospital. In 1930, Balthas Gugel was elected Saginaw County Coroner and served two two-year terms from 1931 through 1934. As the need for a separate building from which to hold services grew, Balthas Gugel moved his business to a building at 310 N. Harrison (pictured), which was located adjacent to his original establishment and residence. In 1938, the building would transition from serving as the location of the Gugel Funeral Home to becoming the bookbinding shop of Carl Dubac. Mr. Dubac, son-in-law of Balthas Gugel who had worked for his father-in-law at the funeral home, was best known in the community for his artful craft of traditional bookbinding, having first established a storefront business at 219 North Hamilton Street before moving his shop into the former funeral home. Balthas Gugel's son, Richard F. Gugel (pictured), was born on May 14, 1903, in Frankenmuth, Michigan. In 1924, he graduated from Haley Hygiene Training School in Detroit and joined his father in the business. In 1927, the Gugels opened a branch office at 602 State Street at Schaefer Street, which was managed by Richard Gugel. The State Street location was also Richard Gugel's residence. When Balthas Gugel moved his business from 310 N. Harrison Street in 1938, he relocated to a building just two blocks north to 419 North Michigan Avenue (pictured). The home also became his permanent residence. The newest Gugel Funeral Home building was the former residence of lumber pioneer Washington S. Green, owner of ﻿W.S. Green and Son lumber mill﻿ (later known as Green, Ring and Co.) located at the corner of Vermont Street and Salt Street along the banks of the Saginaw River. The land where Green's lumber mill was located was most recently used by General Motors Corp. from 1917-2007 for their Malleable Iron foundry operations. Green's home was built in 1864 at a time when two Saginaw cities existed, East Saginaw (east of the Saginaw River) and Saginaw City (west of the Saginaw River). The original address of Green's home was 404 N. Washington before the street name was changed to Michigan Avenue. The address was changed again to 417 North Michigan Avenue before settling at 419 North Michigan Avenue. The Michigan Avenue and State Street locations of Gugel Funeral Home remained in duel operation until 1946 when the State Street office was closed. On December 1, 1941, after 30 years in business in Saginaw, Balthas Gugel died at his home at the age of 65 and is buried in Holy Cross Lutheran Cemetery in Saginaw Township. Richard F. Gugel, Sr., representing the second generation of the family business, had worked with his father for 17 years at the time of Balthas’ death and would operate the funeral home for the next 24 years. In this era, conducting services in the homes of the deceased gave way to families relying on the undertaker to prepare and provide services at their place of business. Like his father, Richard Gugel was elected Saginaw County Coroner in 1938, serving nine consecutive terms, or 18 years, from 1939 through 1956. It is the longest tenure for any Coroner in Saginaw County history. Mr. Gugel did not seek re-election in 1956. Harold C. Wakeman (pictured) was born on December 25, 1933, in Hartland, Michigan where his father, Albert Wakeman, operated a farm on the east side of US 23. His father sold the farm and moved the family to Frankenmuth on Labor Day 1946, where they planned for and began building the town's only movie theater. Construction of the 496-seat Quonset style facility, located at 195 E. Jefferson Street, took 12 weeks at a cost of $27,000. The architect was I. A. Zakryzewski. It opened to the public as the KEN Theatre on September 19, 1947. Al Wakeman named the theatre the KEN because 'Ken' is the middle portion in the name Frankenmuth, as the threatre was situated in the middle of town. Following graduation from Saginaw's Arthur Hill High School in 1951, Harold attended Flint Junior College before graduating from the Wisconsin Institute of Mortuary Science in Milwaukee in 1955. Following graduation he then entered the U.S. Army. Many Frankenmuth residents remember the devastating Wakeman family house fire of September 10, 1956, where Harold lost his 18-year-old sister, Mary, in the accident, and weeks later his mother, Thelma Wakeman, from other complications during her hospital recovery. In 1957, Harold was honorably discharged from active service and remained in the Army Reserves until 1961. It was also in 1957 when Harold paid a visit to Mr. Gugel in Saginaw, who was in a position to hire a funeral director. Mr. Gugel accepted Harold's request and hired him as an assistant funeral director. Though not related, Mr. Gugel and Harold worked well side-by-side; so much so that many families using the services of the funeral home thought the two were father-and-son. Harold continued to work for Mr. Gugel until 1965 when he purchased the 54 year-old business. Out of respect for Mr. Gugel, Harold postponed a formal name change of the business until an appropriate time in the future. On August 2, 1967, after 43 years in business in Saginaw, Richard F. Gugel, Sr. died at his residence in Saginaw Township at the age of 64 and is entombed in Oakwood Mausoleum in Saginaw Township. This funeral file document, dated April 15, 1965, represents the first funeral service arranged by Harold as the new owner of Gugel Funeral Home. The cost of the service came to $864.00, good for a simple, average service for the time. In September 1968, nearly one year after Mr. Gugel’s death and three years after he purchased the business, Harold renamed the business, Gugel-Wakeman Funeral Home. The name stood until 1978 when the business was incorporated and renamed Wakeman Funeral Home, Inc.
Harold followed his two predecessors in politics and served two terms as Saginaw County Coroner from 1969 through 1973. His term was historic as he became Saginaw County’s last Coroner. All future death investigations would be moved under the jurisdiction of the county Medical Examiner. The matchbook at right is one of Harold's pieces of Saginaw County Coroner campaign memorabilia. While the 1864-style building served well as a funeral home since 1938, it became limiting and, therefore, no longer properly serving their client’s needs. For several years, Harold was planning to move the business—even purchasing land in the mid-1970’s on Gratiot Road at Plymouth Dr. By 1979, with new construction drawings completed, discussions of a construction timeline ensued. However, the economy at the time was poor, which included 18-percent interest rates, making it impossible for many businesses to consider any kind of expansion or new construction. Therefore, plans to build were shelved. 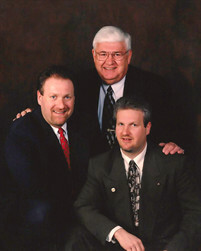 Harold’s oldest son, Brian, completed his education at Wayne State University School of Mortuary Science in Detroit in 1981, became a licensed funeral director in Michigan and formally entered the family business. In 1984, the opportunity presented itself for Wakeman Funeral Home, Inc. to purchase the former residence of Fred W. and Elsie A. Stork (pictured). Fred Stork is regarded as one of Saginaw's industrial development pioneers. His entire career was spent in Saginaw. In 1907, Fred founded the Stork Motor Company to manufacture 3-horsepower, 2-cycle and heavy duty 6 cylinder 7-1/2 x 9, 4-cycle marine gasoline engines for fishing tugs and the knock-down boat business for Defoe Boat and Motor Works of Bay City. Mr. Stork had an office at 304 Hancock St. before he moved the business in 1910 to 1210 N. Niagara St., along the banks of the Saginaw River. As outboard motors began to replace engines in smaller craft, Stork turned the operations of his company to jig, tool, and fixture manufacturing in 1914, and in 1918 renamed the business Stork Engineering Company. Mr. Stork built the three-story home now occupied by Wakeman Funeral Home, Inc. in 1920 on property directly west of his Niagara Street office on the Saginaw River. In addition to Stork Engineering Co., Fred was President of Stork Oil Co. and Saginaw Foundries Co., an electrical steel foundry, at the time of his death. He also owned Riverside Bearing Co., a brass and aluminum foundry. Possessed of considerable inventive ability, he devised improvements in a number of mechanical devices. Fred originated a method of pressing fixtures into pistons in a completed shaft for rotary pumps; aided in developing the fifth wheel that provided stability for large truck trailers; and in 1925, perfected an oil pump jack manufactured by the Stork Engineering Co. and came into use throughout the USA. Fred passed away in Saginaw on July 13, 1956, at the age of 75 years. The move of the former Gugel Funeral Home and Gugel-Wakeman Funeral Home from the 1864-built lumber pioneer's mansion at 419 N. Michigan Ave. to 1218 N. Michigan Ave., just eight blocks, occurred on February 15, 1985. The new funeral home building and property would provide a more open floor plan and increase the firm’s parking capabilities by 800% over its previous location, making it more conducive to larger groups while maintaining a home-like atmosphere—a highly desirable feature among funeral clientele—and keep the business situated along a major Saginaw professional business corridor. In late 1984, the decision was made to purchase the property and move the business to its newest location eight blocks north to 1218 North Michigan Avenue, ending the former building's 46 years of service as a funeral home. Soon after the move, the former building became the meeting place for the Communication Workers of America group for a short time. It was then sold and renovated for use as a Bed and Breakfast. The Bed and Breakfast struggled to draw guests and eventually closed. After being vacant for several years the building fell into disrepair and was eventually purchased by principals from the Faucher Dental Group office next door. On May 19, 2012, the 148-year-old former lumber pioneer's mansion and funeral home was razed. Harold’s youngest son, Rodney, graduated from Wayne State University School of Mortuary Science in Detroit in 1988, became a licensed funeral director in Michigan and joined the firm as its newest funeral director. (L-R) Brian, Harold and Rodney Wakeman in a 2000 photograph. It was at this time that Harold and his wife Judy began to spend more time away from the business, moving more responsibilities to their sons. After 42 years of funeral home ownership, Harold sold the business to his sons on January 1, 1999, marking the official date they took over all day-to-day operations, and becoming the fourth generation to run the business. Local residents may recall Harold's “Think about it…” series of short writings that he placed in The Saginaw News in the 1970s. In 1974, he was included in the Who's Who in America publication. In the 2004 novel An Apology for Autumn by David A. Turrill, the character Frank Sarrow, a mortician, is based on Harold's personal and professional life. Then in a 2014 book by Roberta Morey, Legendary Locals of Saginaw, Harold, Brian and Rodney are all featured together in the Businesspeople and Professionals chapter. One of Harold's many career highlights occurred in June 2005 when he was honored by the Michigan Funeral Directors Association for his 50 years of licensure and dedicated service to his profession at a ceremony held at the Grand Hotel on Mackinac Island, Michigan. On March 17, 2008, after 53 years in funeral service, Harold died unexpectedly at his Florida home at the age of 74 and is buried in Holy Cross Lutheran Cemetery in Saginaw Township. On October 2, 2001, after three years of research and development, Wakeman Funeral Home launched the area’s first funeral home website. The original site included obituary listings and other ground-breaking features, including opportunities for visitors to send condolence messages to the family directly from the obituary. In 2009, the firm completely redesigned their site to include a variety of technologies new to the industry, enabling families the opportunity to tell their loved one’s story like never before. The foundation of this technology includes a personalized memorial webpage for the deceased. Here, visitors can post condolence messages, share photos and videos, and for the family to build a family tree. The funeral home also offers Video Tributes, where they convert family photographs into cinematic DVDs, which serve as memorable keepsakes for all members of the family, and Funeral Webcasting, technology that allows family members unable to travel to the funeral the opportunity to participate in the service in real-time from their computer through a private Internet connection – as their use of the technology was featured in local and national news in 2009. Wakeman Funeral Home is also committed to helping families understand and share the grief they are experiencing. The Grief & Healing section of their website is the starting point for a wide array of grief support services. This is where visitors can sign up to receive free Daily Affirmation messages by email, participate in Group Grief Support sessions, or receive professional personalized grief information through Interactive Aftercare. Also in 2009, with daily newspapers on the verge of its biggest change in its business model in over a century—cutting back their daily printed edition schedules to just a few days per week or eliminating them altogether—the prospects of funeral homes everywhere being able to publish obituaries and service arrangements in a timely manner would be severely threatened. It was then that local CBS affiliate, WNEM TV5, first turned to Wakeman Funeral Home for help in research and development of a new on-air death notice platform. Initially, WNEM TV5 relied exclusively on the knowledge, technical experience and recommendations of Wakeman Funeral Home to help them build a platform that was both affordable for families and user-friendly for area funeral home staff. When it came time to introduce the on-air platform to area licensed funeral homes, WNEM, again, turned to Wakeman Funeral Home. This new on-air death notice platform caught the eye of media and advertisement publications nationwide, including, Broadcasting & Cable, who noted the significance of the new method of advertising. WNEM TV5 continues to turn to Wakeman Funeral Home for help with updates to the system and expansion into markets around Michigan and the U.S. In 2010, the funeral home completed an extensive interior redecorating project and an additional technology upgrade in preparation for their 100th Anniversary, offering their families a warm and comfortable environment during their final moments with their loved one. 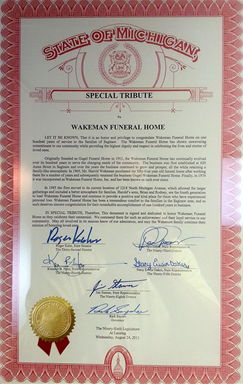 In recognition of the firm’s 100 years in business, the Ninety-Sixth Michigan Legislature presented Wakeman Funeral Home with a Special Tribute. Brian and Rodney Wakeman traveled to the Michigan Capitol on August 24, 2011, where they were presented with the Tribute, honoring the firm's 100-year presence in the Saginaw community during the Senate and House Sessions. The honors were led by Senator Roger Kahn of the 32nd District. Senator Kahn, as well as Representative Paul Opsommer of the 93rd District, Representative Ken Horn of the 94th District, Representative Stacy Erwin Oakes of the 95th District, Representative Jim Stamas of the 98th District, and Michigan Governor Rick Snyder signed the document. Ever since funeral home founder Balthas G. Gugel began his work to provide services in the homes of the deceased in 1911, the undertaker, now funeral director, has been there to provide necessary assistance in caring for the dead while helping the family cope with the loss. Over the past 100 years, funeral service has changed with the needs of the community. Wakeman Funeral Home has made a commitment to continue to provide specialized personal service to help families with their loss. Today, Brian and Rodney Wakeman continue the firm's tradition of helping consumers by participating in advanced voluntary continuing education programs. This training gives them additional tools to help families understand death, grief, the funeral rite, and help families through a myriad of details, the majority of which were unforeseen in 1911. They provide free seminars on funeral preplanning and at-need arrangements to further educate the consumer on necessary funeral details that must be considered, and help families through their loss by incorporating appropriate use of technology into the service that allows them to share their loved one's story like never before. One hundred years in business is a tremendous achievement. In this time funeral service has seen a number of positive changes. The cornerstone of funeral service is to help families through their loss, allowing them to share their grief and make the service personal, one that reflects the life lived. Through lifelong, painstaking training from their father, Brian and Rodney Wakeman are proud to be carrying on the tradition of a family-run business and appreciate the responsibilities and incredible challenges of heading a 100 year-old company. Brian and Rodney Wakeman offer their sincerest appreciation to the families of Saginaw for allowing their company to serve your family over the past 100 years. Their commitment to serve the community with the utmost respect and dignity has never wavered. You are invited to contact them today with your questions or comments about the history of the funeral home or of the services they offer. * Licensed funeral director in the state of Michigan. * 1981 graduate of Wayne State University School of Mortuary Science, Detroit, Michigan and served as class Vice President. * Certified Eye Enucleator from Wayne State University School of Medicine, Detroit, Michigan. * Former Pathologist's Assistant for Saginaw and Midland Counties. * Holds Michigan Limited Life Insurance License. * Certified Funeral Service Practitioner from the Academy of Professional Funeral Service Practice. * National Certified Bereavement Facilitator from the American Academy of Bereavement. * Past President of the Michigan Funeral Directors Association District 7. * Past Member of the Public Relations Committee of the Michigan Funeral Directors Association. * Twenty-Five-Year Honoree as funeral service licensee in the state of Michigan awarded by the Michigan Funeral Directors Association. * Notary Public, commissioned by the Michigan Department of State, Office of the Great Seal. * Featured in book 'Legendary Locals of Saginaw' by author and historian Roberta Morey. * Member and Former Elder at Holy Cross Lutheran Church, Saginaw, Michigan. * Past President of Holy Cross Lutheran School PTO. * Member of the Arthur Hill High School Letterwinner's Association and Serves as the Invocation Speaker for their Annual Awards and Induction Ceremony. * Member of the Michigan High School Athletic Association. * 20- and 30-year basketball official Honoree from the Michigan High School Athletic Association. * Member of the Saginaw Athletic Officials Association #27. * Former Basketball Officials Trainer for the Saginaw Athletic Officials Association #27. * Life Member of the Saginaw County Sports Hall of Fame. * 1988 graduate of Wayne State University School of Mortuary Science, Detroit, Michigan. * Appointed by Michigan's Governor in 2011 and 2015 to the Michigan Board of Examiners in Mortuary Science and currently serves as its chairman. * Board Certified from the International Conference of Funeral Service Examining Boards. * Certified Funeral Service Practitioner and Life Member of the Academy of Professional Funeral Service Practice. * Certified Crematory Operator from the National Funeral Directors Association. * American Funeral Director Magazine's 2012 Funeral Director of the Year - National Runner-up. * President Elect of the Michigan Funeral Directors Association (MFDA). * Member of the MFDA Services Corporation Board. * Chairman of the MFDA Convention Committee. * Member of the MFDA 21st Century Task Force. * Member of the Michigan Mortuary Response Team (MI MORT); ICS-100, ICS-200, IS-700, and IS-800 certified. * Member of the Wayne State University School of Mortuary Science Advisory Committee. * The original funeral director to serve as research & development consultant for local television station WNEM TV5 for their on-air and online death notice platform, including the expansion of the program into markets around Michigan and the U.S.
* Past MFDA District 7 Director. * Past President of the MFDA District 7. * Past member of the MFDA Convention Rules Committee and Credentials Committee. * Past Member of the MFDA Nominating, Public Information, Disaster, Legislative and Audit Committees. * Twenty-Five-Year Honoree as funeral service licensee in the state of Michigan awarded by the MFDA. * President of the Valley Lutheran High School Foundation. * Former member of Lutheran Education Advancement Plan (LEAP) Implementation Team to advance Lutheran education in the Great Lakes Bay Region. * Former chairman of the Valley Lutheran High School Alumni Association Scholarship Committee. * Twelve-year volunteer honoree as Sports Public Address Announcer for Valley Lutheran High School, Saginaw, Michigan. * Member and past president of the Saginaw Downtown Lions Club. * Twenty-year Chevron designee and first recipient of the Lorenz A. Loos Lion of the Year Memorial Award from the Saginaw Downtown Lions Club. * Owner of Great Lakes Media Services, providing photography and writing services to businesses and media outlets. * Licensed Funeral Director in the State of Michigan from 1955-2008. * 1955 Graduate of the Wisconsin Institute of Mortuary Science, Milwaukee, Wisconsin. * Board Certified from the International Conference of Funeral Service Examining Boards, Huntsville, Arkansas. * Originally employed by Richard F. Gugel, Sr. at the Gugel Funeral Home from 1957-1965. * Purchased the Gugel Funeral Home in 1965, renaming the business Gugel-Wakeman Funeral Home. * Member of first group of non-medical students certified as Eye Enucleator through the Michigan Eye Bank. * Past President of the Michigan Funeral Directors Association District 12. * 40- and 50-year Honoree as Funeral Service Licensee in the State of Michigan awarded by the Michigan Funeral Directors Association. * Owner of the Corporation from 1965-1998. * The character Frank Sarrow, a mortician, in the novel 'An Apology for Autumn' by David A. Turrill, was based on Harold; he was also featured in book 'Legendary Locals of Saginaw' by Roberta Morey. * Named Scholarship through the Valley Lutheran High School Foundation -- The Harold C. Wakeman Memorial Scholarship Fund. * Past member of several boards at Holy Cross Lutheran Church, Saginaw. * United States Army Veteran, served as Sergeant, 1955-1961. * Saginaw County Coroner from 1969-1973. * Proclamation recipient from the Michigan State Legislature for service as Saginaw County Coroner. * Recipient of the distinguished Who's Who of Michigan award. * Founding member of the original Saginaw County Drug Board. * Past Instructor for Saginaw County’s original Hospice group. * Past President of the former Saginaw West Side Lions Club. * Past President of the Valley Lutheran High School Booster Club. * Past President of Arthur Hill Letterwinner's Association and Served as the Invocation Speaker for their Annual Awards and Induction Ceremony.